These agents act in the distal portion of the distal tubule and the proximal part of the collecting ducts where Na+ is reabsorbed in exchange for K+ or H+. Their diuretic effectiveness is relatively minor. In contrast to sulfonamide diuretics (p. 162), there is no increase in K+ secretion; rather, there is a risk of hyperkale-mia. These drugs are suitable for oral administration. a) Triamterene and amiloride, in addition to glomerular filtration, undergo secretion in the proximal tubule. They act on the luminal membrane of tubule cells. Both inhibit the entry of Na+, hence its exchange for K+ and H+. They are mostly used in combination with thiazide diuretics, e.g., hydrochlorothiazide, because the opposing effects on K+ excretion cancel each other, while the effects on secretion of NaCl complement each other. b) Aldosterone antagonists. 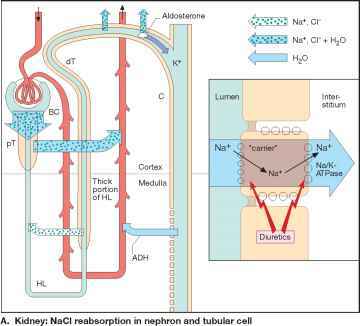 The mineralocorticoid aldosterone promotes the reabsorption of Na+ (Cl- and H2O follow) in exchange for K+. Its hormonal effect on protein synthesis leads to augmentation of the reabsorptive capacity of tubule cells. Spironolactone, as well as its metabolite canrenone, are antagonists at the aldosterone receptor and attenuate the effect of the hormone. The diuretic effect of spironolactone develops fully only with continuous administration for several days. Two possible explanations are: (1) the conversion of spironolactone into and accumulation of the more slowly eliminated metabolite canrenone; (2) an inhibition of aldosterone-stimulated protein synthesis would become noticeable only if existing proteins had become nonfunctional and needed to be replaced by de novo synthesis. A particular adverse effect results from interference with gon-adal hormones, as evidenced by the development of gynecomastia (enlargement of male breast). Clinical uses include conditions of increased aldoste-rone secretion, e.g., liver cirrhosis with ascites.